In summary of Trump-Netanyahu meeting, White House says Trump made note of interests between Israel and Arab states. The White House on Monday night released a readout of US President Donald Trump’s Meeting with Prime Minister Binyamin Netanyahu. “President Trump underscored the United States' ironclad commitment to Israel's security, including the maintenance of Israel's qualitative military edge. Prime Minister Netanyahu expressed appreciation for the President's recognition of Israeli sovereignty over the Golan Heights, and the two leaders reaffirmed the need to continue to counter Iran and its proxies to protect Israel and the region from Iranian aggression,” the readout said. 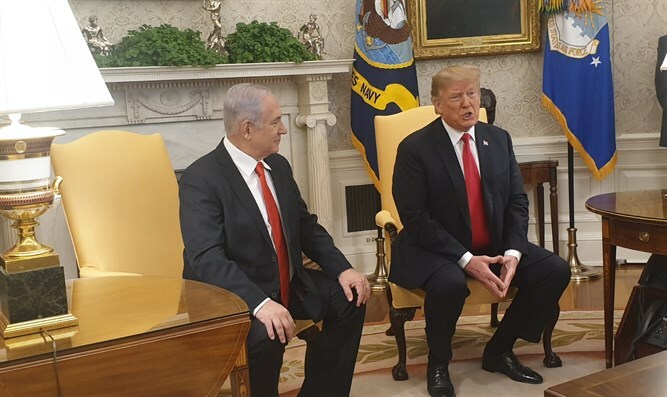 Trump and Netanyahu held a joint press conference at the White House Monday afternoon in which Trump signed an executive order officially recognizing Israel's sovereignty on the Golan Heights. Netanyahu later departed Washington as he had cut his trip short due following the rocket attack on the Sharon region. “It belongs to us. We have historical foundations in the Golan Heights. When you put a hoe there, you discover magnificent synagogues that we are restoring. We returned to the Golan Heights. The Golan Heights is ours. Through our historical rights and the right to self-defense. And President Trump recognized that," continued Netanyahu. "I'm going back to Israel to take care of the important things. I am taking the plane quickly back to Israel and from there will go to the Kirya. We gave a very, very strong response and Hamas needs to know that we will not hesitate to do all the necessary things, not related to anything, not related to the calendar but rather to the needs of Israel's security,” he concluded.